You are given a tree (a simple connected graph with no cycles). Find the maximum number of edges you can remove from the tree to get a forest such that each connected component of the forest contains an even number of nodes. 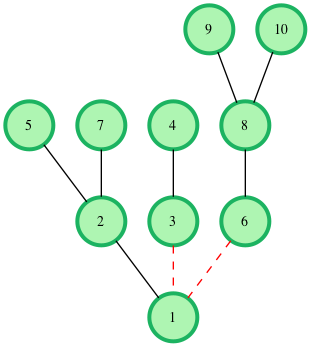 As an example, the following tree with nodes can be cut at most time to create an even forest. Complete the evenForest function in the editor below. It should return an integer as described. The first line of input contains two integers and , the number of nodes and edges. The next lines contain two integers and which specify nodes connected by an edge of the tree. The root of the tree is node . Note: The tree in the input will be such that it can always be decomposed into components containing an even number of nodes. is the set of positive even integers. Print the number of removed edges. Remove edges and to get the desired result. No more edges can be removed.